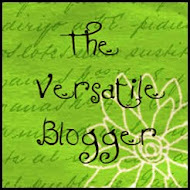 Hi all, I was home sick today and got a chance to play with some of my new Stampin' Up! goodies. 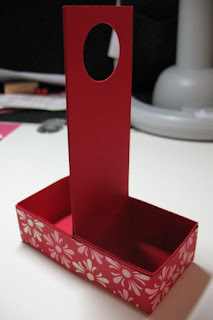 Following are instructions for making this mini milk carton carrier. 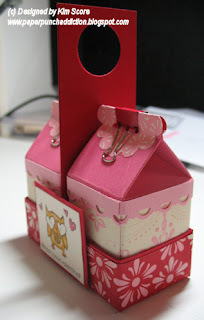 Decorate each of the boxes by cutting a strip of the Sending Love Specialty DSP 1 7/8" x 7" and gluing around the outside of the box. 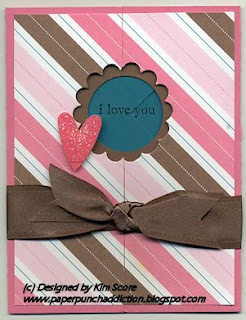 Cut a strip of pretty in pink cardstock 1/2" x 7" and punch with the scallop trim border punch (Sellabration) and glue around box. 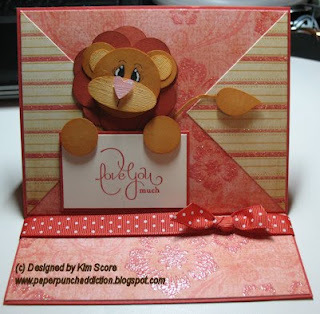 Punch DSP with scallop circle and fold in half. Pinch the box closed and secure with a colored binder clip. I got these in the dollar section at Target. 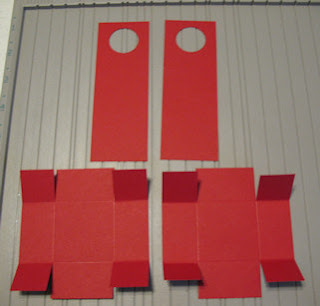 For the carrier, cut 2 pieces of real red cardstock 3 3/4" x 3 3/4" square. Score in 1" on all 4 sides. If you have a score pal, score at 1, turn the square and score at 1 on the next side, etc. Clip the ends of each square as shown. Assemble into a box bottom as shown. 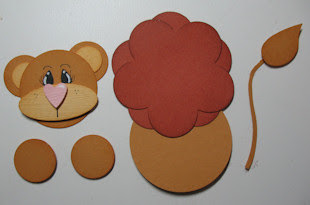 For the hanger, cut 2 pieces of real red cardstock 1 3/4" x 5". 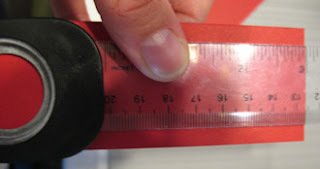 Use the 1" Circle punch to punch a hole at the top of one of the pieces (about 3" from the end of the punch to the end of the paper as shown). 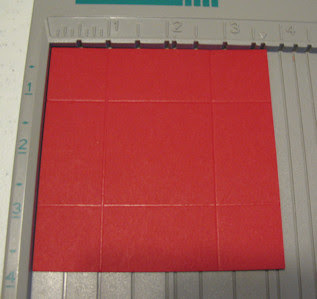 Line up the other piece of cardstock behind the punched one and line up the punch over the top of the already punched hole and punch again (I recommend this technique over trying to punch through both pieces of cardstock at the same time which could jam your paper punch or create an unclean punched hole). 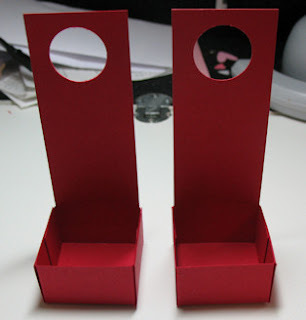 Use sticky strip or other strong adhesive to tape a hanger piece on the inside of each box as shown in picture. Tape the 2 boxes back to back and be sure to tape the hangers together at the top as well. Cut a strip of DSP 7/8" x 11". Wrap around base of boxes and glue in place. 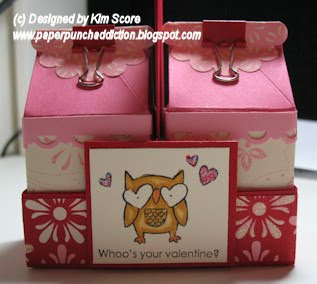 Stamp and color the owl from Whoo's Your Valentine? 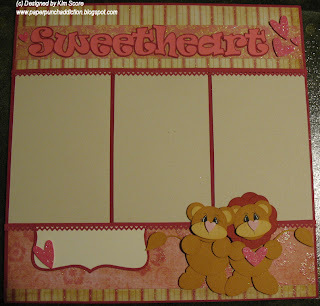 stamp set and mount on real red cardstock. Mount onto side of carrier with dimensionals. 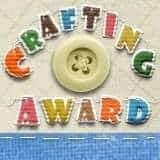 I hope you all have fun making your own little milk carton carriers! 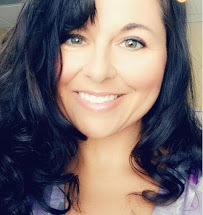 You all know that I use the Martha Stewart teardrop for my eyes as I love the shape and how they look on the finished pieces. 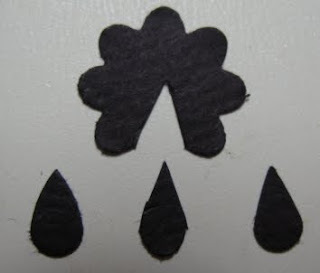 It has been hard for people to find and even the Fiskars teardrop has been a little hard to find. Another good substitute is to punch the small flower with the Boho Blossom punch and then cut one of the petals off as shown. I placed a Martha Stewart Teardrop on the left and the Fiskars Teardrop on the right. As you can see. the size is the same and the shape difference is small. So, if you haven't been able to locate either of the teardrop punches, now you have a good substitute using a punch you may already have. 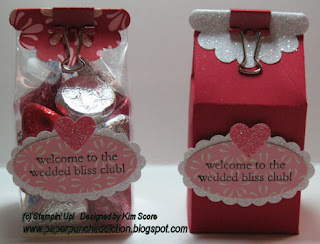 As many of you may know, the ornament punch that I like to use in a lot of my punch art is a Stampin' Up! 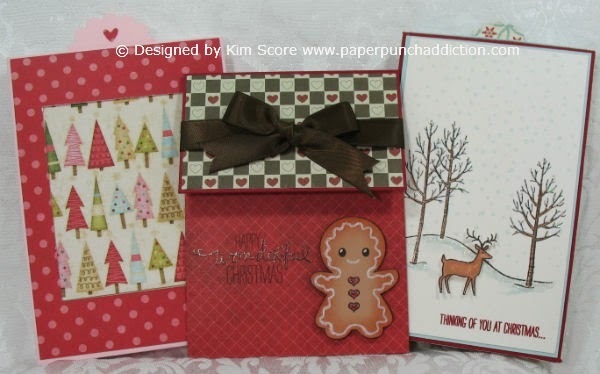 punch that was featured in the holiday mini catalog last year. The sale of this punch ended on 12-31. The fact that I love to use this shape forced me to come up with a good substitute for the shape. Following is the instructions to make it. This is a picture of the ornament punch next to the 2 punches you will need to copy the shape. You will need the 1 3/4" Circle punch and the Large Oval Punch. I punched the 2 pieces in a different color so you can see the 2 pieces layered. 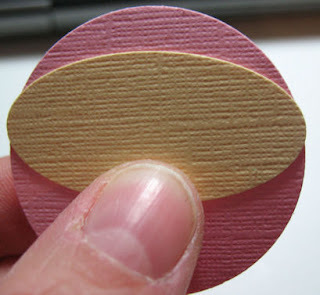 First, line up the large oval over the top of the circle with 1/4" of the circle showing at the top. Trim away the excess at the top of the circle. After trimming away, it will look like this. To get the pointier bottom, locate the bottom center of the circle (you can usually just look and get close). Trim away a small amount one each side from the bottom center of the circle. This picture shows the right side trimmed away. The shape isn't as perfect as the ornament, but as you can see, when I line up the ornament over the cut shape, they line up very closely (with the exception of the really pointy bottom. But, you could cut the bottom center to be pointy instead of rounded if you prefer). 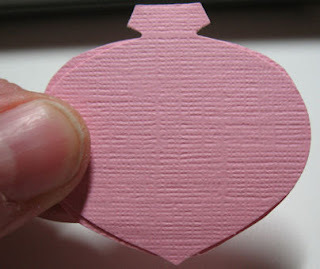 If you don't have the ornament punch but do have the Large Oval punch, you could punch it out of a heavier cardstock and use that as a template with the 1 3/4" Circle punch outs to make your own ornament going forward. 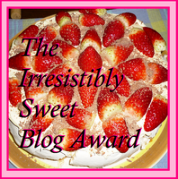 I think this will only be a temporary substitute as I am confident that Stampin' Up! will add the ornament punch to the new annual catalog that comes out in July. Happy punching! 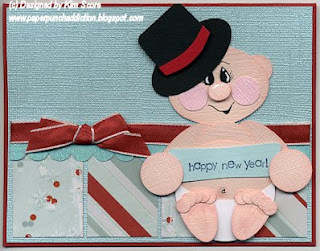 I couldn't resist making one of these cute little new years baby card. Sorry I didn't get pictures taken for this tutorial, but you all should be able to figure out how to put the pieces together. 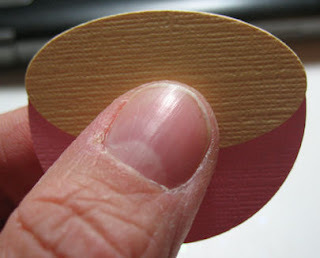 1) For feet, cut small oval in half and then round out sharp corners. Glue 5 of the 1/4" circles on each foot for toes. Overlap the circles. Sponge edges of toes and feet with pirouette pink ink. Color on highlights with blender pen and pink pirouette ink. 2) Punch large oval in white. Line up 1 3/4" circle over the top of the punched hole and punch the diaper. 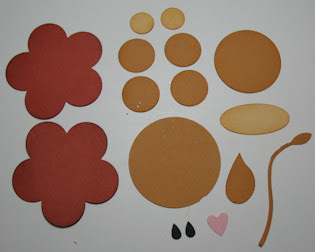 Glue onto 1 3/4" blush blossom belly. Draw on belly button and add highlight with pink pirouette and blender. 3) Sponge wide oval, ornament, small ovals and 3/4" circles with pink pirouette. Attach belly to wide oval body with dimensional. Glue feet onto belly. Glue arms onto body. 4) Stamp and punch new year sign. Glue onto belly. Attach hands with dimensionals. 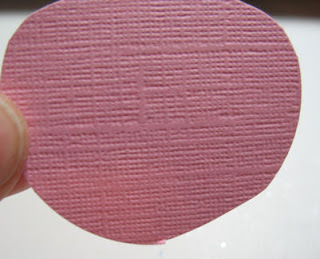 5) Trim 1/2" circle (blush blossom) into an oval for nose. Sponge with pink and attach nose to face with dimensional. Glue on cheeks and ear. Draw on mouth, eyelashes and eyebrows with black zig pen. Add highlights to eyes, nose and cheeks with white uni-bal gel pen. Bassill Bling paper in Sparkle color 4 1/8" x 5 3/8"
I hope you all can follow these instructions. I couldn't find my camera and I didn't want to go searching for it.